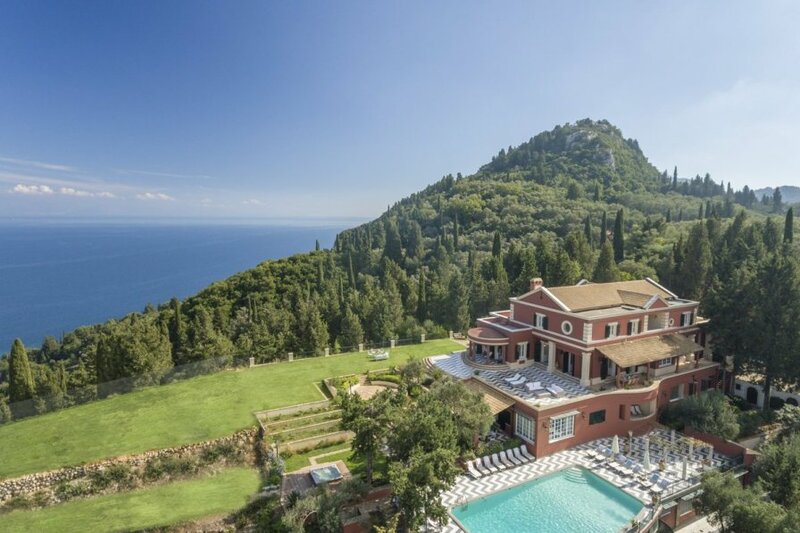 The Achilleo Residence is a tranquil oasis located in a private position in the Gastouri area on the beautiful island of Corfu. Located next to the Achilleion Palace. The Achilleo Residence is a tranquil oasis located in a private position in the Gastouri area on the beautiful island of Corfu. Located next to the Achilleion Palace, it offers luxury accommodation that would be perfect for a large family getaway or a reunion of friends. The villa has been finished with high attention to detail and boasts elegant interiors and lavish furnishings; it offers spacious accommodation which comfortably sleeps up to seventeen guests across eight chic bedrooms. On the ground floor is the main entertaining space which is complete with a sumptuous living room, sophisticated dining room and professional kitchen finished in traditional local style. Heading upstairs, on the first floor, guests will find the impressive master bedroom with king-size bed, en-suite bathroom and lounge area. Also on this level is a further two king-size double rooms and a twin room, each boasting en-suite bathrooms. Heading back downstairs to the lower ground floor, guests will find a further two king-size bedrooms as well as two twin rooms, three of which are complete with en-suite bathrooms. Also on this level is a second TV room and Hamam with a changing room. The outside space is truly magnificent, boasting unique 360 degree views; the villa is set in twenty five acres of garden making it a tranquil and private retreat. Guests are spoilt for choice, with a selection of seating areas, each one perfect for enjoying a quiet drink with a good book. For those looking for a little more action, there is both a large swimming pool, table tennis and even a full-size private tennis court to enjoy! After a long day on the beach, there is no better place to spend an evening than on the terrace, perfect for a spot of alfresco dining while watching the sun set or relaxing in the outdoor jacuzzi. The Achilleo Residence holds a great location, situated nextdoor to Achilleion Palace, the Empress of Austria's home. Located in the Gastouri area, there are helpful amenities including shops and restaurants just a few minutes away. The nearest beaches are wonderful and just a short car journey away.